A sudden and drastic change to your dog’s face is alarming: a sunken eye, droopy eyelid, exposed third eyelid or a pupil that looks smaller than the other could mean your dog has Horner’s syndrome, a complex neurological disorder that affects the eyes and muscles of your dog’s face. Let’s learn more about the symptoms, diagnosis and treatment for Horner’s Syndrome in dogs. 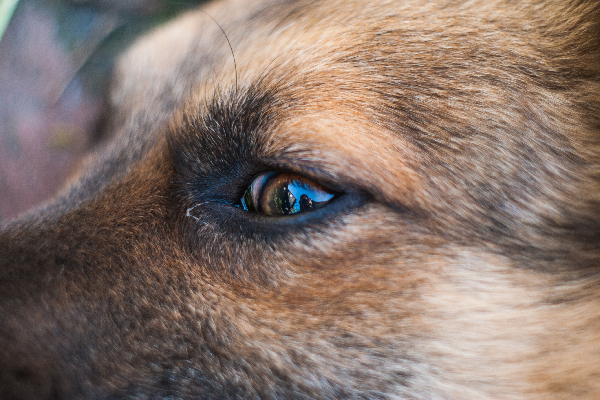 Dog eye closeup. Photography ©Vulkanov | iStock / Getty Images Plus. With Horner’s syndrome in dogs, you might notice a few distinctive signs. Usually, all of these signs occur on the same side of the body. A slightly drooping upper eyelid, which causes the eye on that side to appear slightly smaller than the other eye. An eyeball that looks like it’s slightly sunken in the eye socket. A protruding third eyelid that partially covers the side of the eye that’s closest to the nose. One pupil that appears to be smaller than the pupil in the other eye and doesn’t dilate completely in dim/dark lighting. Rarely, the affected side might be warmer to the touch, and the skin might look “pinker” when compared to the unaffected side. How is Horner’s syndrome in dogs diagnosed? “A diagnosis is usually made in the exam room, based on the findings discussed above,” Dr. Murray explains. Sometimes, a dog might only have a few symptoms, so the veterinarian might need to confirm the diagnosis by trying to dilate the pupil with special eye drops. This cannot only determine if Horner’s syndrome is present, it can also help the vet pinpoint what might be causing it. Similarly, a dog with a spinal injury who is exhibiting Horner’s syndrome symptoms might have other neurologic signs like severe pain, visible wounds, internal injuries or paralysis. A dog with a brain tumor might exhibit other neurologic signs that can help the vet narrow down what’s causing the problem. What is the prognosis of Horner’s syndrome in dogs? Thumbnail: Photography ©Leppert | Getty Images. The post Horner’s Syndrome in Dogs — Symptoms, Diagnosis and Treatment appeared first on Dogster.